Public Relations Manager Cate Casparius ’19 has been participating in Inklings for three years. She posts on the Instagram, Snapchat and Facebook. “I had no idea until I saw the original PR people and I thought I definitely want to do that,” Casparius said. Along with posting for Inklings, Casparius promotes her love for baking on the Instagram account, CateBakes. She creates different dessert masterpieces for her friends, takes pictures of the treats and then posts them online. How Casparius started baking is not how one may expect. “I cheerlead, and I got really hurt last year so I had to get out of school for 3 weeks,” she said. 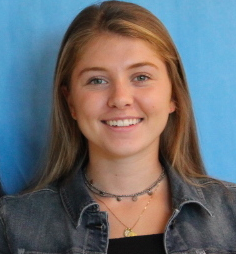 “I couldn’t do anything, so I texted my friends and asked them if they wanted me to bake them something, and that is how it started.” Despite her busy schedule, Casparius is excited to be a senior this year.